An Airman demonstrates the use of the next-generation chemical, biological, radiological and nuclear protective mask known as the Joint Service Aircrew Mask – Rotary Wing during a test and fielding event. In November 2018, the Air Force will complete fielding of an improved Chemical, Biological, Radiological and Nuclear protective mask for aircrew on rotary wing aircraft, allowing operational units to achieve Full Operational Capability. This next-generation mask, also known as the Joint Service Aircrew Mask — Rotary Wing, replaces the Aircrew Eye and Respiratory Protection system on HH-60G and UH-1N aircraft. 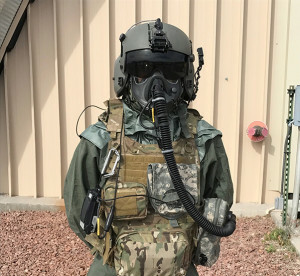 The new mask provides aircrew vastly improved ocular, percutaneous and respiratory protection and integrates with night vision goggles, requires no aircraft modification, and has joint service commonality, a five-fold increase in fit factor, a six-fold increase in battery life, and a removable faceplate. In addition, the mask gives aircrew an enhanced field of view so they can better conduct combat missions in a CBRN environment. Fielding teams from the Joint Program Executive Office for Chemical, Biological, Radiological and Nuclear Defense and Air Combat Command have trained Aircrew Flight Equipment personnel on sizing, fitting and Preventative Maintenance Checks and Services for the JSAM RW mask. They have also trained aircrew in the proper wear and use of the mask. To date, the fielding teams have trained approximately 100 AFE personnel and about 75 aircrew.